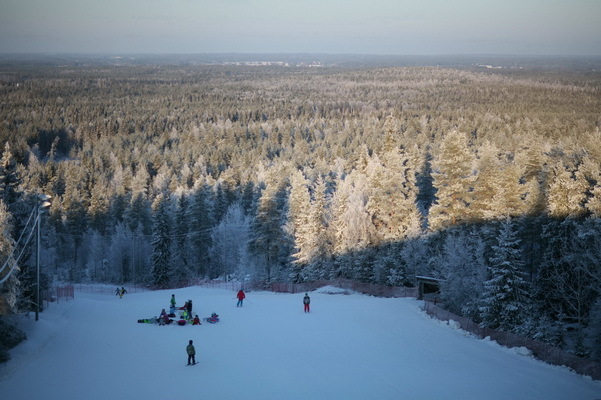 Snowpark Parra is a beautiful small scale Ski Resort situated in Western Finland. Parras ski season begins in December or January and lasts to the end of March. In Parra everything is near and easily reached. We serve the skiers with three well-maintained slopes and three lifts. Our slope ”Pikkurinne”, The Small Slope, is especially suitable for beginners – even for those who have never been on snow before! Easy-to-use rope lift takes you up. On our Park Area ”Street” can enthusiastic skiers try our jumps. All around our slopes you find other fun jibbing obstacles like rails – for all skill levels. Two T-bar lifts can take you to the top in about four minutes. Parra Rental Shop is a fine place to rent alpine skis, snowboards and boots, in all sizes – and everything else you need for downhill skiing, like helmets and goggles! Parra Bistro Restaurant serves hamburgers and some home style cooking too. In the spring time you can sit in the sun at the terrace while enjoying your coffee or hot chocolat. Ski School Parra offers private lessons also in English – just remember to book beforehand! Beside alpine skiing and snowboarding you can try a pulk (a small toboggan) in a special small slope for pulks. Great fun for children and grown-ups too! Pulks can be loaned for free. Ski trail routes up to 100 km can be reached beginning at Parra Ski Resort. Unfortunately our Rental Shop has no cross-country skis to rent, so you have to bring your own. Snowpark Parra opening hours can be found on the frontpage. Feel free to ask more via email or by phone! For accommodation, some well equipped cottages are offered to rent. For more details and contact info see Länsimetsä Log Cottage.